FACT CHECK: Trump's False Claims On 'Medicare For All' In USA Today Op-Ed President Trump packed a lot of disinformation into his op-ed column for USA Today attacking a Democratic health care proposal. Here are five points to know. 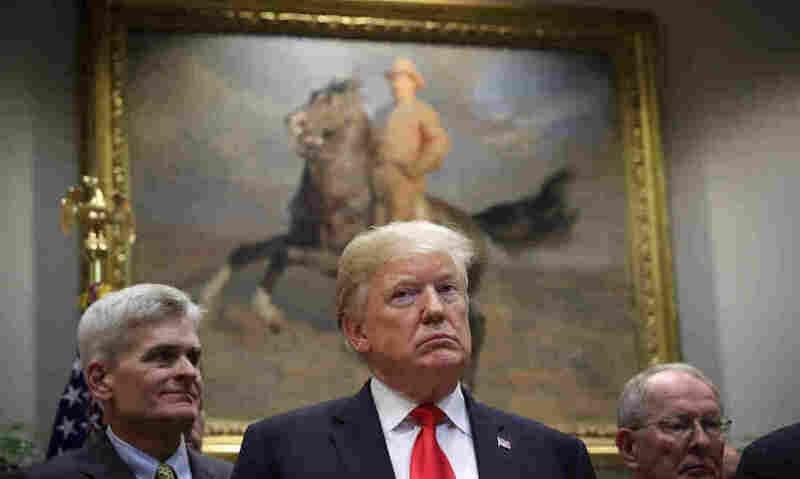 President Trump attends a signing ceremony for health care measures in the Roosevelt Room of the White House on Wednesday, the same day USA Today published an opinion column on the topic by the president. 1. The political context: Health care has emerged as a dominant issue on the campaign trail in the runup to the November elections. According to the Wesleyan Media Project, which tracks congressional advertising, health care was the focus of 41 percent of all campaign ads in September, outpacing taxes (20 percent), jobs (13 percent) and immigration (9 percent). Democrats are particularly focused on health care, devoting 50 percent of their ads to the issue, but health care is also a leading issue in Republican commercials (28 percent), second only to taxes (32 percent). Perhaps sensing that Democrats are gaining traction, Trump has decided to go on the attack, targeting the Democratic proposal known as "Medicare-for-All." 2. Cost of the plan: Trump claims that expanding the federal government's Medicare program would cost $32.6 trillion over a decade. But as Business Insider reports, that would actually be a discount compared with the nation's current health care bill. Trump's figure was calculated by the libertarian Mercatus Center, but he fails to note that total health care spending under Medicare-for-All would be about $2 trillion less over the decade than currently projected. The federal government would pay more, but Americans on the whole would pay less. 3. Health care rationing: Trump claims — with no supporting evidence — that "the Democratic plan would inevitably lead to the massive rationing of health care. Doctors and hospitals would be put out of business. Seniors would lose access to their favorite doctors. There would be long wait lines for appointments and procedures. Previously covered care would effectively be denied." Detailed implementation of any single-payer plan would of course be subject to substantial negotiation. But the Medicare for All bill drafted by Sen. Bernie Sanders, I-Vt., states explicitly that "Nothing in this Act shall prohibit an institutional or individual provider from entering into a private contract with an enrolled individual for any item or service" outside the plan. 4. Pre-existing conditions: Trump notes that as a candidate, he "promised that we would protect coverage for patients with pre-existing conditions." In fact, Trump and his fellow Republicans tried — unsuccessfully — to repeal the Affordable Care Act, which guarantees insurance coverage for people with pre-existing conditions. GOP plans would leave it up to the states to craft alternative protections. In addition, Republican attorneys general have sued to overturn Obamacare's protections, and the Trump administration has declined to defend them. America's Health Insurance Plans, the trade group for the insurance industry, warns that ending the Obamacare guarantee could result in hardship for the estimated 130 million Americans under 65 with pre-existing conditions. "Removing those provisions will result in renewed uncertainty in the individual market, create a patchwork of requirements in the states, cause rates to go even higher for older Americans and sicker patients, and make it challenging to introduce products and rates for 2019," AHIP said in a statement in June. 5. Strength of Medicare: Trump writes that "Democrats have already harmed seniors by slashing Medicare by more than $800 billion over 10 years to pay for Obamacare. Likewise, Democrats would gut Medicare with their planned government takeover of American health care."